Understanding a fearful dog has its challenges. The more I understand what makes Louise scared, the better I able to help her manage her behavior. But even after 7 years, I don’t know all of Louise’s triggers. Just when I think that she is calm and able to handle a passing dog, she lunges and loses it. For example, we walked by a parked car yesterday and there was a lady sitting in it with her window down. The dogs and I didn’t see the lady. As we started to walk past, close to the driver’s side, the lady said out her open window “hello.” That startled Louise and she reared and growled and barked. It feels like 2 steps forward, 1 step back, much of the time. She growls and aggressively barks at people or animals that make her nervous. This includes running the fence line and when people enter the house. She cowers and does other submissive behaviors, like hiding behind me. This is mostly in the house. This is common when there are loud noises, like fireworks, or thunder. She pulls and lunging toward the person or animal that makes her scared. This is out of the house on leash behavior. The worst and most dangerous fear-based reaction she has is that she snaps and bites at people that scare her. It is usually unprovoked by the person. My theory about why she is so fearful goes back to her possible lack of socialization during that critical sensitive period of puppyhood at 6 to 10 weeks of age (see my recent post on this topic). I think that she was probably left alone in a barn or a field, or under a rock, with maybe her mom and sister and had very little human interaction in her early weeks. Since there was a collar embedded in her neck when she was rescued, clearly someone put the collar on her and then ignored her as she grew bigger over the weeks. I rescued her at about 20 to 24 weeks, so the lack of socialization already imprinted her fear center by that time. I am a big proponent of avoidance and distraction. 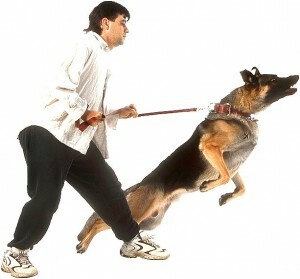 When I see someone walking a dog toward us, I try if possible, to turn around and walk the other way. This way Louise never gets close enough to enter what I call her Red Zone. There is a certain distance at which she will start to show stress. She can manage to hold it together only for so long and then she enters the Red Zone from which there is no coming back. The weird thing is that it is not with all dogs or people, so I never know exactly when she is going to blow. She really hates big white dogs, but one of her best friends is a white Shepard mix. She doesn’t like the little yappy dogs around the neighborhood (Havanese, Lhasa Apso, etc.) but she doesn’t mind the old blind pug or the scrappy loose mop that lives down by the river. If she knows certain dogs she can be fine with them, but not all dogs. She is actually fine at the dog park off leash. When walking Louise I try to be very aware of what is coming and going around us. I try to anticipate what is around the corner whenever possible. The more distance I can have between us and a stranger or strange animal, the better able I am to reduce her fear and stress. When frightened on a walk, Louise tries to make the scary thing, person or animal, go away by growling, barking, and/or lunging. My method is first to try and remove her from the situation. When unfamiliar dogs are coming towards us, I turn around, walk down another street, sometimes, if trapped, I will walk up someone’s driveway and keep Louise’s focus on me. I think it is weird but many dog people don’t understand that when I turn around and walk the other way (with 3 dogs in tow), I am trying to avoid them. Many times those people will follow right behind us or cut us off as I round the street (my neighborhood streets all loop around because we are a peninsula). When I can’t avoid a strange dog there are a few things I do. First, I make everyone sit and look at me until the dog/person passes. Louise is better if the stranger is in front of us (which makes sense so she can see them). Sometimes, I place my body in her line of sight to force focus on me. Then, once they pass, I can move along at a safe distance. When a runner or walker or even a car comes by, I always have the dogs sit and wait until they pass. For me, keeping everyone under control is critical for their safety, mine, and of course, the stranger/strange animal. Having all dogs ‘sit stay’ is my key, not that I trust that Louise won’t lunge if not watched. A mistake that I used to make was to tighten up on her leash when walking past things that I knew scared her. This was so I could control the lunge if it happened. However, I think that my tension traveled down the leash to her and reinforced her negative behavior. Now I try to be more aware of just moving along and not reacting. I want to believe that the leash is not the control mechanism between me and my dog, but, sadly, when Louise sees red, no words seem to keep calm or control a fearful dog. I can feel the dog tension when there is an outside cat, fox, or squirrel nearby. I just keep walking and try to have them ignore the critter. Squirrels can be very stupid (as we know) and I have even had foxes come directly in front of the pack without a care. This is not so easy to handle other than using my ‘ignore’ command. When they ‘ignore’ something like this, they get a treat. It really depends on how close the threat. Too close nothing works other than to get out of the zone as quickly as possible to regain equilibrium. Finally, I practice what I call the ‘look at me’ technique. Giving her a treat when she focuses on me. When she looks in my eyes. Every chance I get, I try to reinforce her ‘looking at me’ for guidance and direction. My hope is that by her focusing on me, which is safe, she can calm down enough to move along. Distance, avoidance, distraction, and focus. These are the tools in my Louise bag. If your dog is leash aggressive and fearful you might want to consider a professional trainer to help you with getting control of the situation. If a walk is not fun for you, it surely no fun for your dog. 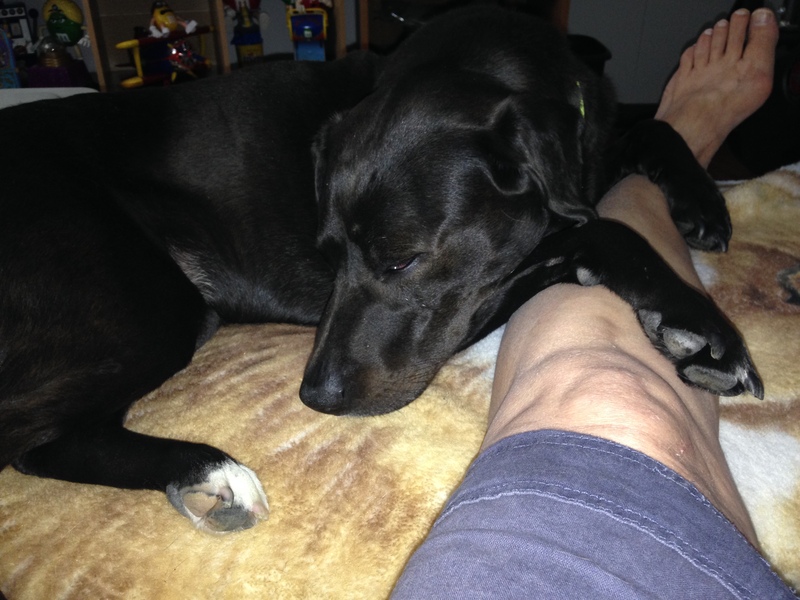 DogDaz Zoo: Loving Fearful Dogs – Was She Abused? Rescuing animals, especially when they are several months old or older, means that you will never know how they were treated in their early formative weeks. Because of her fearful behavior, I thought that Louise might have been abused as a puppy. She came into our lives when she was 4 or 5 months old. Louise was fearful and shy from the moment we met her. Her foster said that she had a collar embedded in her neck and she was covered with Demodex (red mange). The rescue had liberated Louise and her sister, Thelma, from some guys in a pickup truck in the parking lot of a kill shelter down in South Carolina. Based on this story, I assumed she was neglected, if not worse, in her early months. Recently, I am rethinking that idea. I have been reading about the critical socialization time for puppies that occurs between 6 and 10 weeks. This is called the ‘sensitive period.” Before 6 weeks, puppies see everything in their world as good. This is the time that they associate smells and other things potentially as good stuff for the rest of their lives. Then around 5 or 6 weeks FEAR sets in. You can read more regarding one of the most important studies done around early socialization in different breeds detailed in the book ‘Genetics and the Social Behavior of the Dog’ by John Paul Scott and John Fuller, published in 1965 (Scott and Fuller, 1965). Instead of early abuse, maybe Louise was not socialized during her most sensitive development stage and that is why she developed her life-long fears. 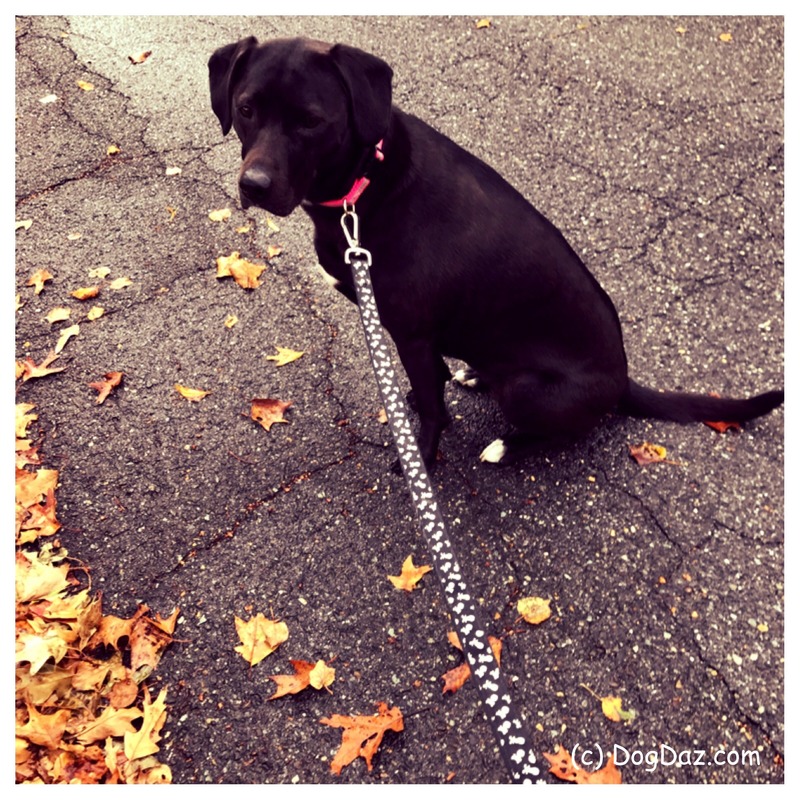 Louise is leash aggressive and afraid of strangers, both human an canine. Though I have worked with her to manage her behavior in stressful situations, it would really help if I understood the root causes. 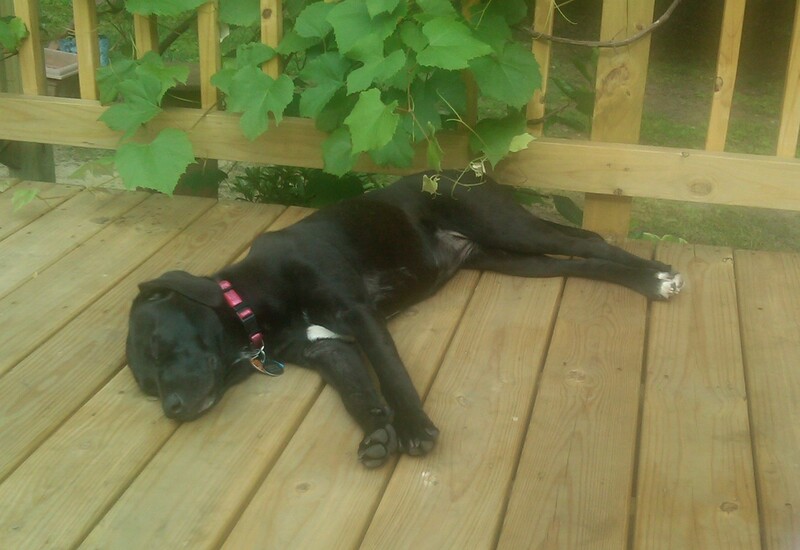 When you rescue, it is rare to know what happened during that critical puppy time. Maybe when she was still little there were additional things I could have done to change that fear imprint. Over the years, I have done much to quiet her fears and provide a safe and supportive environment in which she has flourished. 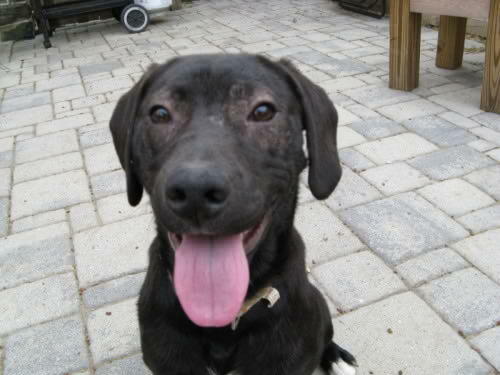 She is a very happy dog at home but fearful, especially on a leash, and needs special attention. 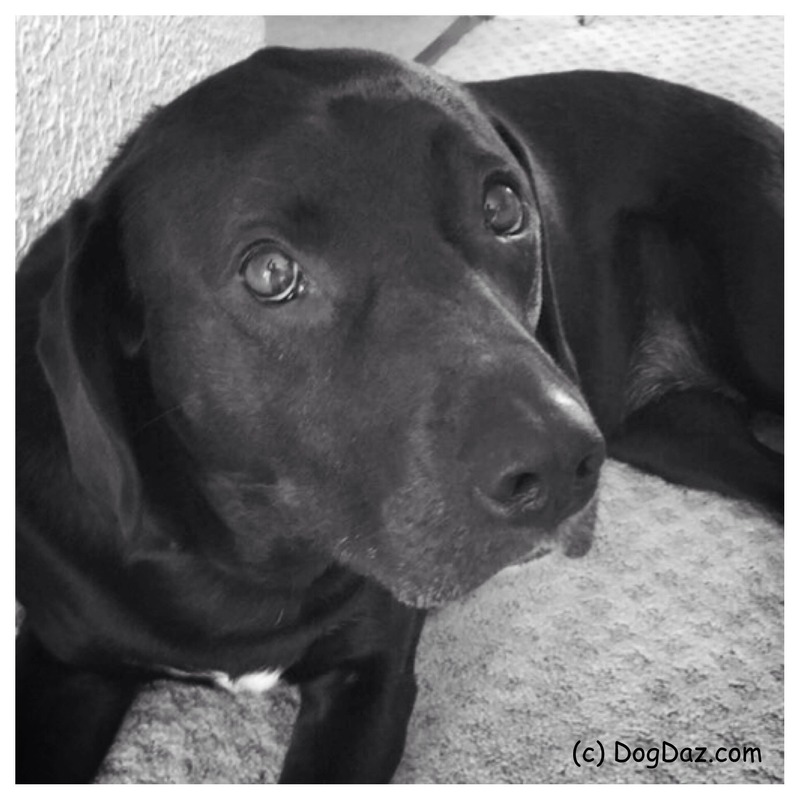 Are there ways to undo the emotional damage in dogs? 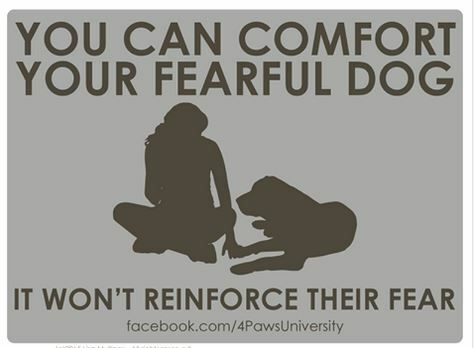 Good article on comforting your fearful dog. “Fear is an emotion. Emotions are involuntary responses. Reinforcement refers to an increase in behavior. Behaviors are voluntary responses. That fear can keep you safe. It can keep you from entering into a dangerous situation. You need to listen to your gut and respect your fear and the fear of those around you. That it is best to keep things simple, which keeps them less scary. Like not walking in the middle of too many people all at once, which can be overwhelming. That small steps can be very big. For example, when Louise does not bark or cower at every human that we pass, that is a victory. That learning what freaks you out, and avoiding it as much as possible, can make a world of difference in the rest of your day. Oh yes, and that black dogs are beautiful. I believe that people and animals and situations all come into my life for the lessons that they teach me (and I them). Thank you Lulu Belle for my lessons in being more aware of the world around me and you, for listening to my instincts more, and for being patient.